SO, the last time I updated my blog was on Thursday, extubation day, and we’d had a heck of a day with leaky Gtubes, dropping O2 sats and heart rates, and crash carts being run to our room. Today… we have a much different story to tell! It has been officially 140 days since Annabelle entered this world. 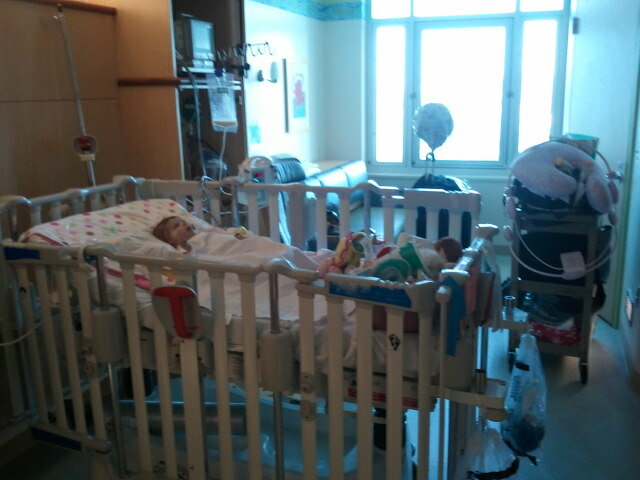 We spent the first 3 days in the NICU, and the next 137 days in the PICU. We’ve had 4 “codes,” I’ve lost count of how many reintubations, 2 open heart surgeries, one stomach surgery, and one very scary couple of days where the only thing keeping her alive was ECMO, the heart-lung bypass machine. And today, we’ve made a GIANT leap up one floor to the sixth floor. We are officially… for the first time… OUT of the Intensive Care Unit! This is a HUGE big day for us. 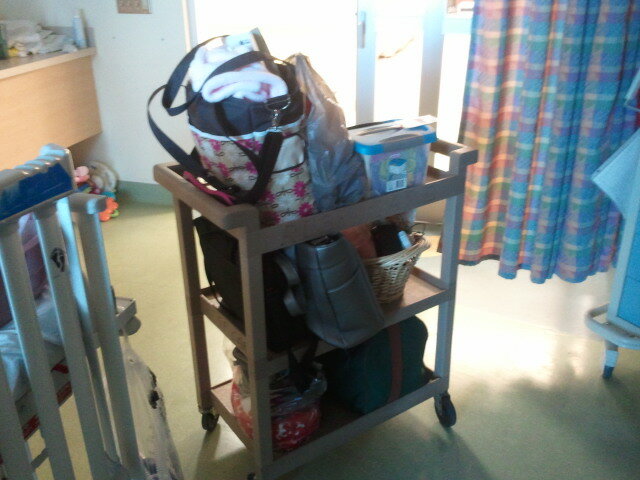 We packed up our room, and took the fun elevator trip upstairs. I gotta be honest though. I am out of my mind nervous. Granted, I’m EXCITED too because this is a BIG BIG step in the right direction. 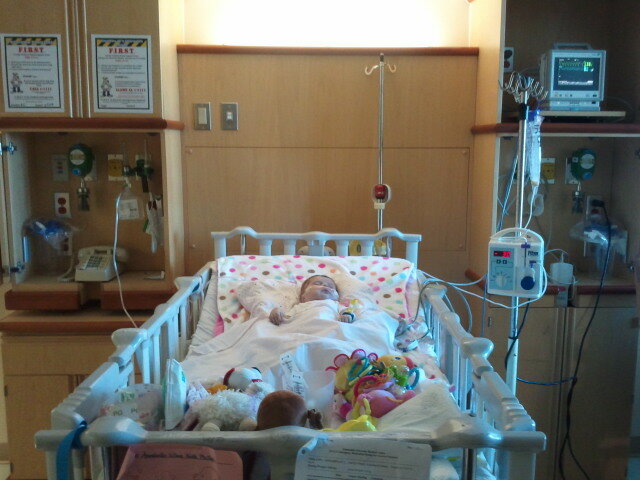 It’s also the nervousness that in the ICU, someone was constantly watching my baby. While they still watch her here, it’s not nearly so much. They’ll check on her every hour. If her monitors go off, they’ll watch them remotely. Now, while I’m here, that isn’t a big deal. But I work during the day… and have to go home at least 2 times a week. The thought of leaving my baby here in a room all by herself for hours on end absolutely breaks my heart. Not to mention the fact that my hubby is at home with my other kiddos and he really needs to be here more often, as he will be taking care of her during the days once she comes home. All this complaining and worrying aside… GOD will work it all out. I know He will. My prayer has been for a long time that we can be home by Christmas. I’ve told God I’m okay if he says no… and I still feel that way. But it’s looking more and more like it’s at least within the realm of possibility. He has brought us thus far… all 140 days of this craziness, and I’m trusting that He will bring us the rest of the way too! Sleeping… getting ready for the big move. Mommy packing up… we have a LOT of stuff here. This is probably a forth of it… I made a lot of trips! I think she likes it. Don’t you? Oh Krista – Praise God!!!!!!!!!!!! Love you all and so thankful that are prayers are being answered!!! Wonderful news, Krista! She looks so beautiful and so content in that last photo. Rejoicing with you! That's WONDERFUL!!! I'm so glad you took a pic of her looking around at her room. That was so cute! She's like, "Man. This is cool!" It's gonna be okay. This is SUPER AWESOME COOL!!! Aw, I have tears in my eyes. So happy for the news and I'll pray that God calms your nerves. This is awesome news!!! 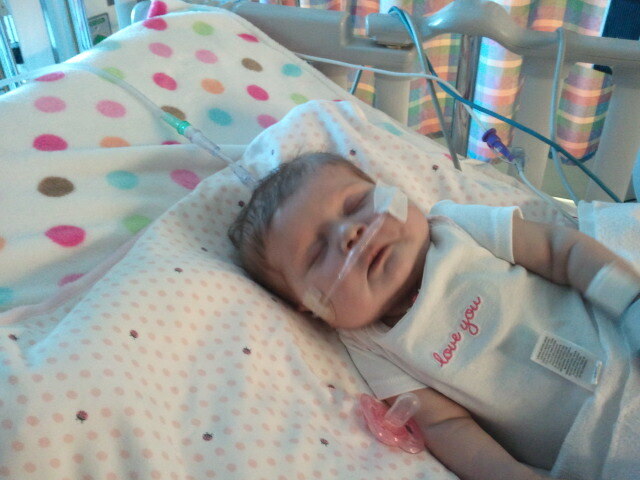 I'm thrilled to hear that Annabelle has made so much progress that she's out of ICU. I hope the lessons and everything else entailed by the move go smoothly. Oh, this is so wonderful, Krista! Continuing to pray that she will be home for Christmas! God is so good. Great news!!! Oh I'm so glad. Oh, happiness! God is so good. Rejoicing with you and praying for all of you. Yeah! I'm excited for your new adventure. What great news! I love the pictures; she is so cute! That's amazing!! I have new things to pray about now for you and Annabelle and the rest of your family! That is so awesome, Krista!! So happy for you all! Your baby is so beautiful. She, you and your family are in my prayers. God is soooo good, isn't He? May He continue to bless you all richly. Crying and celebrating this HUGE leap forward. And still praying. WOO HOO! 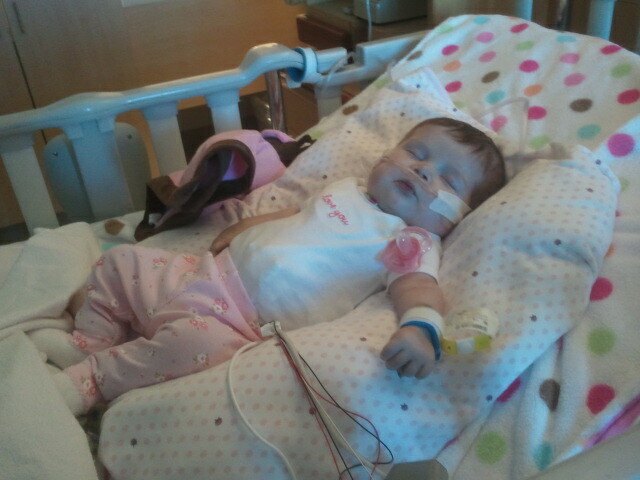 Annabelle looks so beautiful and very at peace with the move to MODERATE care!! I am so happy for you! Yayayayayay! This is wonderful news! What an answer to prayer! I was thrilled when I read your comment on Bowen's blog. I had to come here and see more details. 🙂 I understand the nervousness. That is normal (or at least that is what we felt, too, when we first made our move several years ago). God will continue to help you as He has already. Continue to trust. We will continue to pray. Oh she is so adorble and looks so tiny in that bed. I am so happy for you and your family for this WONDERFUL news!!! I was wondering if they have Annabelle on telemetry? I know that was something that was done while Daniel was on "the floor". Even though the nurses weren't constantly present in his room, they informed us that there were other people on another floor viewing his data via telemetry. If they do it there, I thought it might help ease your mind a little. Thanks everyone! We are super excited, and still getting used to this slightly new routine. 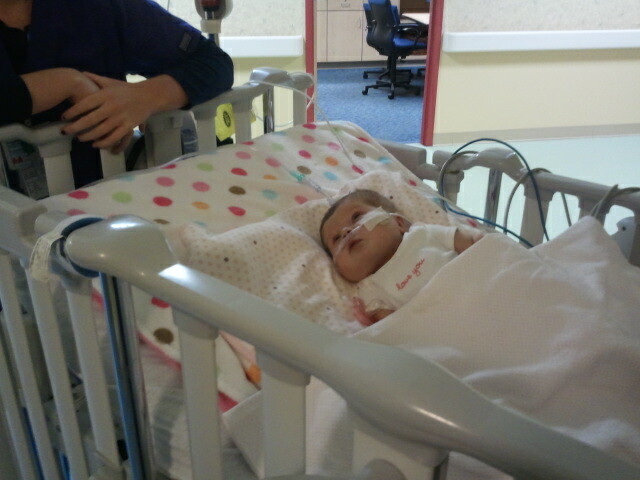 Tammi, not sure what telemetry is, but she is hooked up to a monitor similar to the one in the PICU, just smaller. And it does page the nurse if the numbers drop (monitors heartrate and O2 sats), so that DOES make me feel better. But the nurse isn't always right here and so if she cries or turns blue or gags (all likely things for Annabelle) no one would see until those things make her numbers to bad… I know, I'm probably being overprotective and we won't be able to see her 100% of the time at home either… but it's just an adjustment. Love the pictures! So happy for you! So VERY happy to hear this!! Yay!! What wonderful news! I just am reading your blog for the first time and I've gotten caught up. What an adventure you have been on! Keeping your family in our thoughts and prayers that your wish of home by Christmas comes true! Sounds like you're on your way. I know what you mean about the floor being scary. I was shocked when my daughter went to the floor how little "attention" I felt like they paid in comparison.